This is new concept art for Star Wars: The Last Jedi, revealed courtesy of io9. 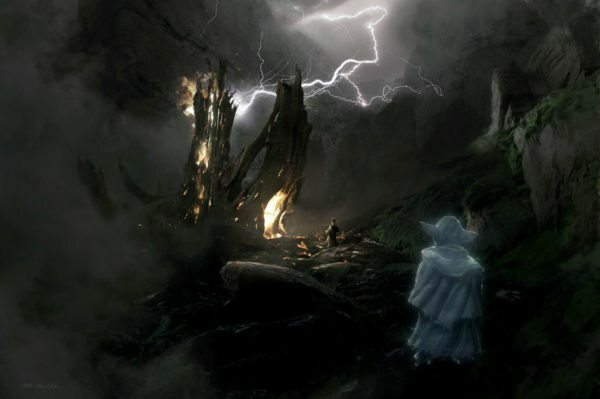 This collection of concept art for the film come from illustrators Seth Engstrom, Kev Jenkins, James Clyne and Adam Brockbank and features Luke Skywalker, Kylo Ren, Vice Admiral Holdo, and Master Yoda. The film was written and directed by Rian Johnson and stars Mark Hamill (Luke Skywalker), Carrie Fisher (Leia Organa), Adam Driver (Kylo Ren), Daisy Ridley (Rey), John Boyega (Finn), Oscar Isaac (Poe Dameron), Lupita Nyong’o (Maz Kanata), Domhnall Gleeson (General Hux), Anthony Daniels (C-3PO), Gwendoline Christie (Captain Phasma), Billie Lourd (Lieutenant Connix), Andy Serkis (Supreme Leader Snoke), Peter Mayhew and Joonas Suotamo (Chewbacca), Tim Rose (Admiral Ackbar), Mike Quinn (Nien Nunb) and Warwick Davis, Jimmy Vee (Pan) as R2-D2, Kelly Marie Tran (Ladies Like Us) as Rose, Benicio Del Toro (Guardians of the Galaxy) as DJ and Laura Dern (Jurassic Park) as Vice Admiral Holdo. Check out the rest of the art below. "In Lucasfilm’s Star Wars: The Last Jedi, the Skywalker saga continues as the heroes of The Force Awakens join the galactic legends in an epic adventure that unlocks age-old mysteries of the Force and shocking revelations of the past."